I have been volunteering with Dogwood for close to 2 years. I love the outdoors – hiking, kayaking, biking and camping – and want to make sure our beautiful environment is protected and preserved. I am very concerned about climate change and decided that rather than complain about it I would try to make a difference. My husband Doug and I are fortunate enough to have a lovely home in North Vancouver. Hosting the North Shore Potluck and Strategy Session was a great opportunity to meet like-minded people and discuss a strategy for the upcoming federal election. Our potluck on July 28 was a huge success!! Doug and I hosted 42 people at our home where we ate delicious food and made new friends. I was so impressed to meet people of all ages from across the north shore who share my passion for our beautiful province and who want to make a difference in the upcoming election. New friends share food in the early evening sun. 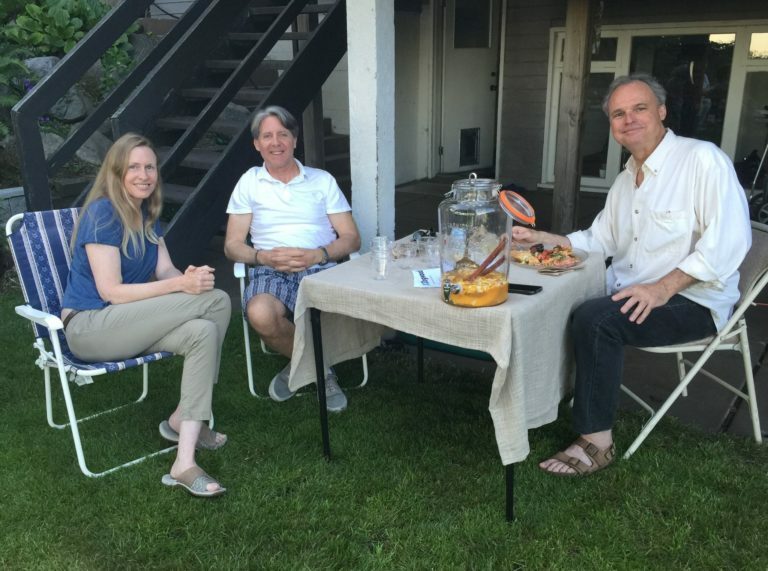 It was a lovely sunny evening and we enjoyed sitting in the garden and hearing about Dogwood’s strategy for the federal election. I am excited about the possibility of electing a new government this fall and the role that Dogwood can play in getting people engaged and aware of the issues so that they can make an informed vote in October. Thanks everyone for coming to the potluck and supporting Dogwood.